As I mentioned in this post, I’ve been cutting back on carbs (mostly the bread type) in an effort to shed some winter weight and get back into shape for summer, and just to be more healthy in general. There is far too much bread and pastries in my daily life, a little detox does me good every so often. Pizza is one of my (many) carby vices. I can eat it all day, everyday. No joke. And I’m not at all picky – frozen, cold, homemade, gourmet… all are welcome to the party. You can see how this can become a problem. I’ve been curious about cauliflower crust pizza since I discovered it last year on a gluten-free food blog, but never tried it until now. Boy, was that a mistake! We looooved this pizza. Like really, really. We joked about making these for sleepovers and team parties when we have kids. We’re totally going to be that weird granola family. I’m looking forward to it. 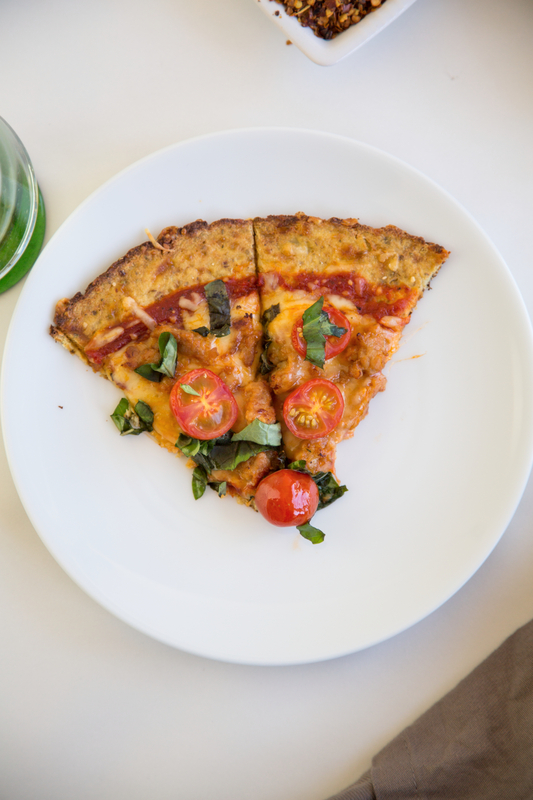 While, I’m giving you the recipe for the pizza that you see (which was really delicious and I highly recommend), this post is really about the cauliflower crust. You can dress it with any toppings you’d like. Enjoy! 1 italian sausage, casing removed and cooked, breaking it down with the back of a spoon. Preheat oven to 425 degrees F. Place a pizza stone in the oven at this point if you have one. Cut cauliflower into florets and discard the stems. Steam using a steamer basket (or whatever method you like) on low heat for about 10 minutes or until the cauliflower is just tender, but not fully cooked. Place steamed cauliflower into a food processor and pulse to create “crumbles”. Try not to over process, you don’t want cauliflower puree. Transfer your crumbles to a clean tea towel and ring out as much moister as possible. Give it a good squeeze. Transfer dry cauliflower crumbles to a medium-sized bowl and mix in egg, cheeses, salt, oregano, garlic, and crushed red pepper. Turn out onto a piece of parchment paper and pat into a 10-inch round. Place crust with parchment paper on heated pizza stone (if using), pizza pan, or baking sheet. Bake for 15 minutes. Top with sauce, cheese, sausage, and tomatoes, and bake for another 10 minutes. NOTE: If using a pizza stone, slide crust directly onto the stone using a spatula before the final bake to ensure a crisper crust. Let rest for 3-5 minutes. Top with fresh basil before serving. I agree! Such a versatile veggie. I’ve actually run it through a ricer and made cauliflower mash in place of potatoes before. Also really great. This looks amazing! I’ve wanted to try a cauliflower crust too, just haven’t done it yet. Can’t wait to try this! It was super tasty, I was really happy with the results. It’s mildly time consuming, but fully worth every effort. SO excited to try this! I’m pizza obsessed…I try to eat clean but it’s my weakness! This looks DELISH! Thank you! Mmmmm pesto sounds like an excellent idea. Hmmmm, I kinda feel like maybe adding a little to the cauliflower “dough” itself before cooking might be interesting. Time to experiment! Definitly giving this a whirl! Thanks for sharing!! You’re welcome!! I hope you enjoy it!! I just bought a pizza stone last weekend and was lamenting the Trader Joe’s dough options because of the gluten. I cannot wait to try this — it looks delicious! Lauren, you will LOVE it. Obviously it’s not going to replace yummy gluten-full pizza dough, but it’s a great alternative. Let me know what you think! This looks absolutely amazing! I don’t have a gluten intolerance, but I’ve really been wanting to try a cauliflower crust just for the sheer veggie factor :) I’ll definitely be trying this one! Thank you! I hope you enjoy it, we sure did!! Look incredible! 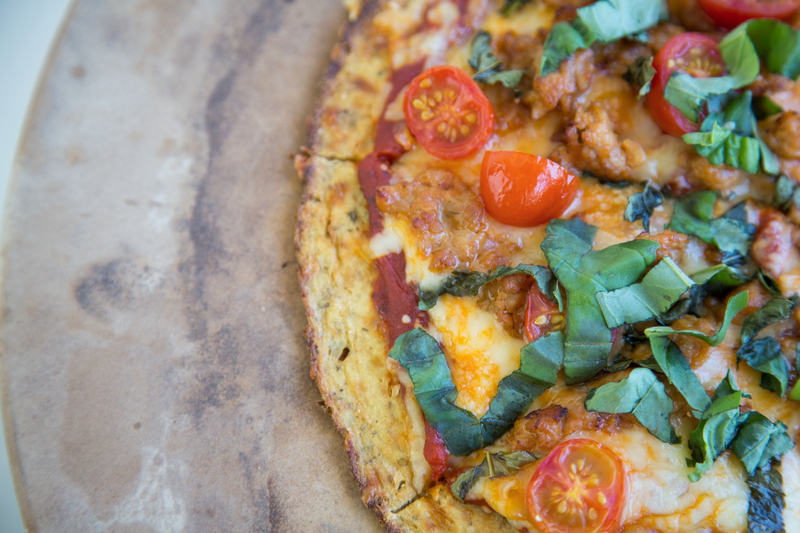 I’ve read about cauliflower crust pizza and have been wanting to try it forever. I’m more inclined since you made it look so good! Thank you so much! It was as good as it looks, I promise!! I’ve seen this idea, too, and wanted to try it. Now I will! I have tried two almond flour pizza crusts, but I ended up scooping off the toppings and just eating that. Do you have a good recipe for sauce? I actually don’t have a good recipe for a sauce…but that makes me think I should make one! I really like Wholefoods standard pizza sauce. It comes in a small can and is fairly inexpensive. But thanks for the inspiration, I may just have to make my own pizza sauce for the blog! I am definitely trying this soon! I just made cauliflower “mac” and cheese and was thoroughly impressed with how delicious it was as a replacement for traditional noodles! Yes! I’ve had cauliflower mac as well and was also impressed at how good it was. Ours had a butternut squash “cheese sauce” that resembled the real deal so much, it blew our minds. The whole thing was completely vegan and we could have eaten it forever! I think you’ll love this crust! We love pizza in my home, I will absolutely give this a try! I’ve heard of chickpea crusts before but never cauliflower. Thanks for sharing a healthy/unusual take on one of my favorite guilty pleasures! Funny, I haven’t heard of chickpea crust! I must try that next! This cauliflower version was mighty delish!! I hope you enjoy! This is SO creative!! Both my parents are gluten-free, I’ll definitely be giving this a go. Also just seems healthier and less bloaty. Veronica, I think mom and dad will be uber happy if you make them this pizza! xo! Oh my, brilliant! Love it! Seems fairly easy..I am gonna attempt to make it this weekend. Thank you! I hope you enjoyed it. Is your name Paro? I love it! Wow, Paola, this looks amazing! And this is such good news for Weight Watcher fans! We’ve been wanting to start making pizza at home, so here is the challenge! Mert, it WAS amazing! you really should try it, I think you guys will love it :) xoxo! I chopped the cauliflower into “crumbles” while still raw and then baked it for 15 minutes on a cookie sheet. I stirred it twice during the 15 minutes. I did not squeeze the water out as it dried a bit during the baking process. I then followed the recipe as suggested. This saved cleaning a food processor. hi mike what’s the oven temp you set to when baking the cauliflower? 425 degrees, same as the pizza. I am making my second batch right now, as I type this. Just made this for my birthday dinner. Best grain-free crust that I’ve tried! I’ll definitely make it again. This is what’s for dinner tonight! Time to get creative :) Nom. Nom. Oh my gosh! I love you for posting this! :) I love bread and pizza but need to REALLY cut back. Will be trying this out very soon! Hi! I was just wondering, how strong is the cauliflower flavor in this crust? Thanks! I don’t think it’s strong at all. I’m a cauliflower fan, however, so maybe I’m not the best judge but it gets fairly camouflaged with cheese herbs and pizza toppings. It’s really delicious, I promise! Agreed, I do not think it is strong, neither do my daughters. But my wife doesn’t care for this. Give it a try and see. Definitely on my list to try!! You’re in for a surprise! Enjoy! that is SUCH an awesome idea for a pizza crust! cannot wait to try this! I have made a zucchini & cheese crust forever– cauliflower sounds great! I am excited to try it! Can you make the crust ahead of time and frozen for later use? You’re no fool!! I’ve used a grater myself, works great :) I’ll go give your recipe a peek. Thanks for your comment!